Sustainable Society: Does growing plants truly sequester carbon? Or does it just delay the release of carbon? Does growing plants truly sequester carbon? Or does it just delay the release of carbon? In the game of decreasing the atmospheric carbon levels thought to be a main culprit in global warming, one effort underway is to grow plants in an effort to sequester the atmospheric carbon. Basically plants breath in CO2 and breath out O2, meaning the carbon stays in the plant. Generally speaking there is a harmonic balance between plants and animals where animals breath out CO2, plants breath out O2, and these two chemicals are mutually beneficial for both of us. In theory then as atmospheric carbon levels are rising, either naturally or on purpose there can or should be an increase in the number of plants, so that the plants can sequester all that carbon for us. That's what I thought the other day when I came across this in my walk around the block. 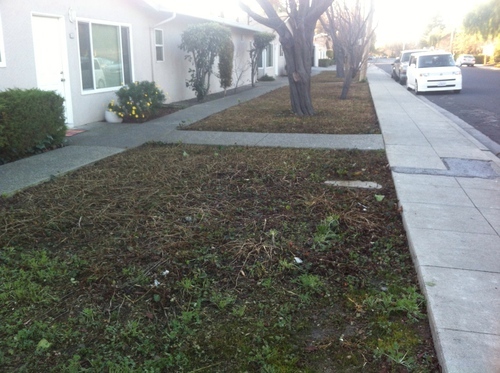 This segment of "yard" in front of an apartment complex in the neighborhood had been full of vine-like growth. I remember it being kind of nice but also unruly, being a bit chaotic in nature. Recently the owners of that yard can, as you see, cut everything to the ground. The result is that the plant matter which had grown here went somewhere, so the question is what happened to the carbon that had been sequestered in those plants? The question is applicable not just to this yard down the street from me, it applies to every yard at every house around the world, and to the tree-planting carbon sequestration projects underway around the world. By looking at this specific microcosm of an event we can ponder how the same equation is playing out around the world. For example - companies that want to earn some social responsibility credibility can by "Renewable Energy Credits" from companies that produce some kind of positive benefit. The REC's are meant to offset whatever harmful thing the company is doing. It's easy to compare this to Indulgences which were said to be sold to rich people so they could go on with their sinning ways, but perhaps some organizations who create REC's are doing some positive good which those who buy the REC's are supporting with their dollars. A frequent sort of Renewable Energy Credit enterprise is tree planting. A group will plant trees, so they can sell REC's. In other words - the yard down the street grew some viney bushes, sequestering carbon, or the tree planting organizations plant trees, and also sequester carbon. It's the same sort of activity, just on a different scale. The goal of these REC producing organizations is to sequester carbon and do good things for the environment, right? Well, a cynic might say they're just looking to make a buck, hence my analogy to the Indulgences earlier. So let's consider the life-cycle of a tree for a moment. A tree can grow pretty darn big, right? That's a lot of carbon into the body of the tree. Along the way the tree gathers other values. It becomes habitat for a variety of animals and bugs and other plants. Another value is that it's body is made out of wood. Modern industry has developed a zillion uses for wood and hence desire trees for their wood. The tree grown for the purpose of sequestering carbon will eventually be die, or be cut down. No tree will last forever, so eventually it will meet up with one of those two ends. What happens to the carbon that tree sequestered? Likewise - when you cut the grass in your lawn, what happens to the grass and the carbon sequestered into that grass? There's a zillion different ways around the world how plants grow and then are cut down or die, releasing their sequestered carbon. Some plants are food, and its carbon might get fed to a cow and later become a hamburger. Some plants are wood, and could be processed into paper, or into timber. Paper often gets used willy-nilly and just thrown away, while timber often goes into making buildings which will stand for a few or a few hundred years. Some plants are flowers, that a lover might receive, look at for a couple days, then put in the trash when they begin to wilt. Some plants live in the wilds, they grow, they die, the wilt, in nature, and their remains return directly to nature. On and on and on.. the varieties of destinations for plants are myriad. Which of those purposes are the most effective at preserving the sequestration of the carbon? For example a tree might be grown solely for firewood, and once the firewood is burned its carbon is released directly into the atmosphere. A tree that's grown to become timber, that's then turned into a house that stands for 500 years, that's carbon that stayed sequestered for a long time. A tree that's grown for pulp to make toilet paper, it's carbon doesn't stay sequestered for very long, eh? A concrete example is the corn plant. The main purpose for growing corn is the fruit, the corn kernels on the corn cob. This is often thought of as food, but increasingly corn is becoming ethanol. But what about the rest of the plant, the part that's called 'Stover'? This is the corn husks, the stalks, and the root system. What happens to Corn Stover? Traditionally the Stover would be plowed back into the ground to become a kind of compost and enrich the ground. However modern agriculture isn't about enriching the ground, meaning Corn Stover is seen as a "waste" and the people pushing for cellulosic ethanol look to sources like Corn Stover as feedstock for processes to create fuel. Ethanol is thought to be a carbon neutral fuel in that it takes carbon out of the atmosphere, but once the ethanol is burned its carbon goes back into the atmosphere. Hence it's not terribly effective at reducing atmospheric carbon. So here we come to the end of this pondering. A neighbor cuts the vines in their yard and then what do they do with the vines? I don't know. Maybe they made a pile to burned them, or maybe they made a compost heap and the vines became next years fertilizer. The main thing we've learned is that the effectiveness of a carbon sequesteration effort depends a lot with what's done with the plants when they die or are cut down.